Originally an adjunct to our removal services, Nomad’s parcel services have grown to become central to our business. From our popular “Crete Express” services to our new Nomad Parcels website serving the rest of Greece, Italy and Europe, people rely on Nomad to send their parcels all year round. This is our own parcel service, where we transport goods to and from the island of Crete in our own trucks. Besides “parcels”, many people order other items directly from retailers and send them to Crete through the Crete Express: we regularly transport furniture including sofas, beds and flat-packed furniture; whole bathrooms, whole kitchens; even sheds, hot tubs and saunas. Anything you want from the UK can be delivered to Crete via the Crete Express, and it is very cost-effective. The Patra Express service is the same as our Crete Express service, but for Patra. 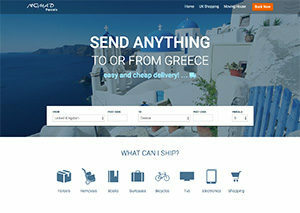 Send parcels to or from Patra on a “depot-to-depot” basis, or we can collect and deliver too. Shop online in the UK and have Nomad bring your goods to our depot in Patra for you to collect them – it is the most cost-effective way to transport goods to Greece. Nomad Parcels is our amazing new service: Nomad’s partnership with UPS which enables us to deliver parcels cheaply to all of Greece, including Athens, Thessaloniki and all of the islands. Through this service we can access the extensive UPS parcel network at much cheaper rates than booking directly. On the Nomad Parcels website you can send parcels to Greece, book and pay online and receive your tracking details, all through the website. Our Crete Express and Patra Express services now allow you to send groceries too! So you can now order from supermarkets and have the deliveries sent to our Peterborough warehouse, where we will pack the goods for you and bring them to Crete or Patra. Only perishable and dangerous items are not allowed – everything else can be ordered from supermarkets and brought to Greece for you by Nomad. Nomad Parcels also allows you to send parcels to Italy! With transit times as quick as 3 days, and excellent prices (especially for larger items), Nomad Parcels is the ideal solution. Book and pay online and receive full tracking details all through the website. We have developed extensive expertise in “parcel forwarding“, which is the process of receiving parcels for our customers and forwarding them to their address overseas. We have been doing this through our Crete and Patra services for many years, and now through our UPS partnership we can forward parcels to the rest of Greece and almost all of Europe! So you can now buy online at UK retailers, have the items sent to Nomad, and we will forward them to your European home through the UPS network. Visit our parcel forwarding services to find out more.